Extension cords can be a convenient way to deliver power to a variety of electrical appliances and devices. However, when used without proper precautions, an extension cord can be a tripping hazard and cause harm through electrocution and fire. Each year extension cords are responsible for over 4,000 injuries and 3,300 house fires resulting in as many as 50 deaths. Extension cords should be a temporary solution to a problem. They are not intended for long-term or constant use. An excessive use of extension cords indicates that your house may have too few electrical outlets for your needs. Contact a licensed electrical contractor to add electrical outlets and perhaps update your home’s electrical system. Be aware that there have been many recalls of extension cords, particularly during the holiday season. These cords, that are usually imported, create risks of fire and electrocution by having poor solder joints, reversed polarity or undersized wires. Even a well-made extension card can become a hazard if it is not properly used. Purchase medium or heavy-duty extension cords approved by independent testing organizations such as Underwriters Laboratories (UL) or ETL. Avoid inexpensive, bargain products. Only use polarized cords (one blade wider than the other) that prevent electric shock, or three-prong plugs. Never file down a polarized blade or cut off the grounding pin to fit into a non-polarized ungrounded receptacle. Use three-prong cords in properly grounded three-slot receptacles. The third prong provides grounding and reduces the risk of electrical shock and fires. Also, never use two-prong adapters with a three-prong plug. Use extension cords marked for outdoor use in damp areas or outdoors. These cords should only be plugged into an outlet that is protected by a Ground Fault Circuit Interrupter (GFCI). Read all the information on the package and on any attached labels noting the maximum amperage. Match the load with the appliance you are connecting while not exceeding 75% of the maximum amperage. Exceeding the amperage rating could cause overheating. If there is no amperage marking, assume the maximum load is 10 amps if 50 feet or less in length. Never overload extension cords by running more than one appliance per cord. Just because there are five outlets doesn’t mean they should all be used at one time. Use only the length of extension cord that is necessary. Extra length increases electrical resistance and therefore decreases the power the cord can deliver. Do not plug multiple extension cords together. Inspect extensions cords before using. Discard any extension cord that feels hot to touch or appears frayed. Unplug extension cords when they are not being used. Extension cords can deteriorate over time when in continuous use. Do not use staples or nails to attach extension cords to surfaces. Do not cover extension cords with rugs or tape. Do not run extension cords through holes in floors, walls or ceilings as a semi-permanent installation. These installations prevent heat from escaping and create fire hazards. 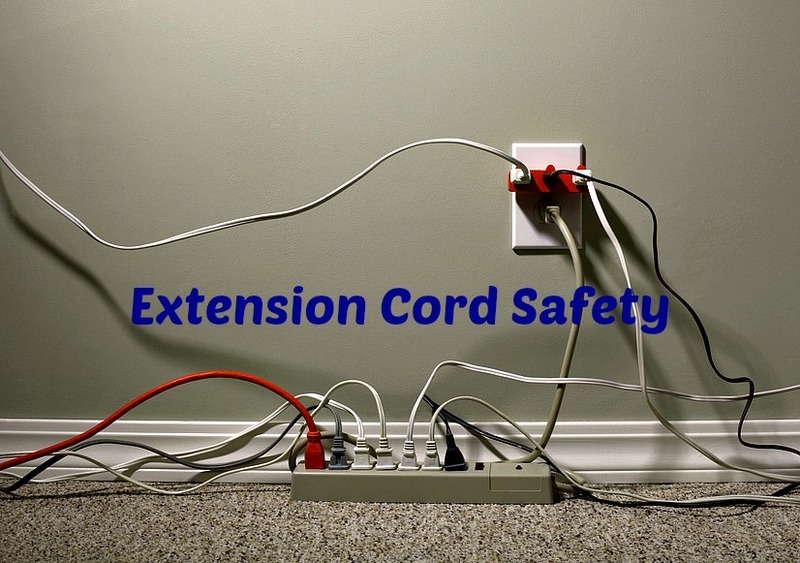 Everyone should be concerned about extension cord safety to reduce injuries from tripping and fire hazards. Protect your home, your family and your appliances as well as your technology devices.